On January 27, the world watched in horror as Donald Trump signed an executive order barring people from Iraq, Syria, Yemen, Libya, Somalia, Sudan and Iran from entering the United States for 90 days. Although the courts may rule against them, administration officials have warned they will be “very aggressive” as they expand the countries added to the ban list, making clear that this is only round one in a much broader xenophobic plan. 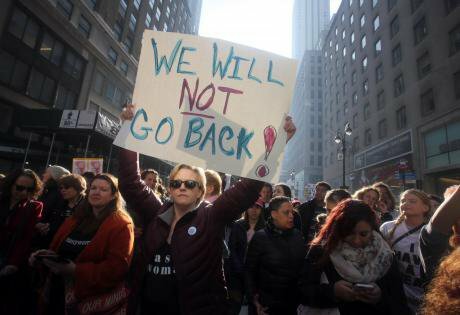 Every March, when the annual UN Commission on the Status of Women (CSW) meetings are held, women’s rights activists seize the chance to come to New York City, lobby global policymakers and collaborate with each other. Now, many are asking themselves how we keep the doors open for those activists from banned countries. Some are questioning if CSW should be postponed or even moved to Geneva, in solidarity with those who cannot attend. Far from it. Substantial civil society participation at CSW in New York this year would be an act of solidarity, creating a critical show of resistance against autocracy and the US administration’s xenophobia and misogyny. Right now, we should be talking about how to best leverage CSW in New York to make a stand for global gender justice in this moment of crisis. Rather than accommodating Trump’s exclusionary agenda, we should be asking ourselves how to fortify and expand our movements amidst the global rise of right-wing authoritarianism, closing borders, and shrinking civil society spaces. The US isn’t just the latest country to fall sway to reactionary populism: it’s also the most powerful. That makes the UN in New York the front lines of a battle to defend international cooperation and human rights—not just in the US but around the world. The Trump administration would like nothing more than to rid the US of progressive, international civil society organizing. We must not let that happen. CSW is a chance for advocates to speak out about blatantly misogynist US policies like the “global gag rule,” to underscore the gendered dimensions of many governments’ xenophobic policies, and to expose how these policies harm the most vulnerable. CSW is the first major international conference to take place at the UN since the rise of Trump. Fighting to maintain access to this space is critical not just to defend the gains of the global women’s movement, but to hold the space open for the many human rights movements who rely on the UN in New York as a key site of advocacy with governments. From the Indigenous Peoples Forum in May to LGBTIQ advocacy week in December, the UN headquarters in New York is a critical lobbying space for activists. These conversations and the global alliances we build at CSW are exactly what Trump wants to quash. Moving CSW to Geneva will only be a victory in Trump’s eyes. What’s more, moving CSW to Geneva would still exclude participants, since only two of the seven countries in Trump’s ban have Swiss Embassies or Consulates that issue visas. The move would also feed US right-wing extremism and play directly into its anti-UN rhetoric. Trump’s executive orders have also banned all refugees from entering the US for 120 days and indefinitely banned Syrian refugees. At particular risk are those refugees who suffer from double discrimination, including women and lesbian, gay, bisexual, transgender, intersex and queer (LGBTIQ) people. Because of their sexual orientation or gender identity, they are targeted with discrimination and death threats, and are forced to flee to save their lives. Last year, due to the organizing efforts of OutRight Action International and others, the crisis of refugees fleeing ISIS persecution based on sexual orientation or gender identity was made visible when the UN Security Council convened the first ever Arria Formula to address LGBTIQ violations. Two LGBTIQ activists from Syria and Iraq recounted their personal stories of persecution and violence in horrific detail. Through their presence and by bringing their brave stories into the halls of power, they shifted the conversation on the global policymaking agenda. Trump’s ban closes off this possibility for countless activists to give their testimonies to policymakers. Historically when women have been denied access to civic spaces, we have come together and pushed back. We know that if we cede the ground we’ve gained, it will be all the more difficult to reclaim it later. Bars to entry against people from marginalized communities are not new. In 2012, when the US denied visas for anyone who “engaged in prostitution” from entering the country to attend the International AIDS Conference, activists considered boycotting—but they rejected that option. Recognizing the importance of protecting civil society spaces, participants organized in throngs. From India to Bangkok, they organized side events where activists were Skyped in on jumbotron screens to ensure participation of those who had been blocked. Activists also set up an informational webpage that advised on the visa process and on rights if questioned by a customs and border patrol officer. They set up petitions calling to change US law and kept up the pressure even after the conference was over. This is the model we should borrow, as we face the exclusionary tactics of this Administration. The Trump administration attack is not only targeting women from the seven banned countries. This is an attack on all who are women, who are brown, who are immigrants, who are queer, who are non-US citizens. One thing is clear. CSW needs to respond to this crisis. It needs to be a hub of organizing for protection of all women who are threatened by right-wing authoritarianism—especially women from the seven banned countries. Women coming into CSW have already spent months of preparation organizing bilateral meetings, side events, travel arrangements, visas and funding. 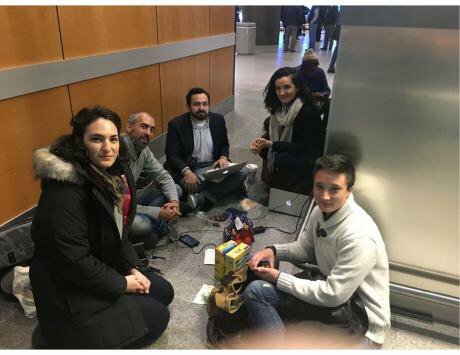 CLEAR's CUNY law students at JFK airport providing legal assistance for detainees under Trump's Muslim Ban. In the face of government-fanned hate, we must highlight the voices of women and other gender justice advocates from the seven countries on Trump’s Muslim ban. We must turn each empty seat, unoccupied by a woman who has been banned from the country, into an indictment against the US Administration’s policies. We have the means to accomplish this, for example by holding video conference events that allow them to still be heard and by using our numbers to spark mass strategic protest. We must mobilize all our assets, like support from CUNY Law School’s CLEAR (Creating Law Enforcement Accountability & Responsibility), to secure legal protections for people affected by these bans. We must hold our ground against Trump’s hateful policies and act to discourage other governments from following his lead. And come to New York for CSW, 13-24 March. Join MADRE and other organizations as we launch a campaign to denounce the Trump bans that threaten democratic participation and human rights. Speak out for those who would be denied access. Support mass demonstrations and organizing by women’s and human rights movements, and show solidarity with all of us who are under siege. Now is the time to stand our ground.